Sparen & Leihen als Alternative zu Mikrokrediten? 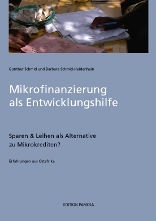 The book appeared on January 24 (2013), but is available only in German for the time being. For the content see our website in German. We envisage an English version if there is sufficient interest in this publication at the English reading market, provided that we find a sponsor for the costs of translation.